Ekopark Tekirova Antalya . : www.ekopark.com.tr : . 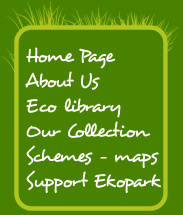 Welcome to the website of Ekopark, the first Ecological Natural Park of Turkey. Here you can learn much about animals and plants and watch video films as well. Our friendly staff will be happy to answer all your questions. •	Construction must be stopped in coastal areas. •	Nature protection laws must be adopted. •	The use of chemicals must be considerably reduced to prevent chemical pollution. •	Hunting must be officially prohibited. •	Nature protection funds must be established. •	Research should be better financed. •	Endemic and Red Book species of plants and animals must be protected by law. •	The non-regulated rent of coastal areas must be stopped. •	Basics of ecology and natural sciences must be included into primary school curriculum. •	Petroleum wastes and by-products of petrochemistry must be effectively disposed. •	Industrial filters must be installed to prevent air pollution. •	Preventive measures must be taken not to let sewage water into water reservoirs. •	Severe punishment must be provided for violating nature protection laws. •	Ecological parks are established and supported by the state. •	The use of mineral fertilizers in agriculture must stopped. •	Medicinal plants are to be controlled and protected.